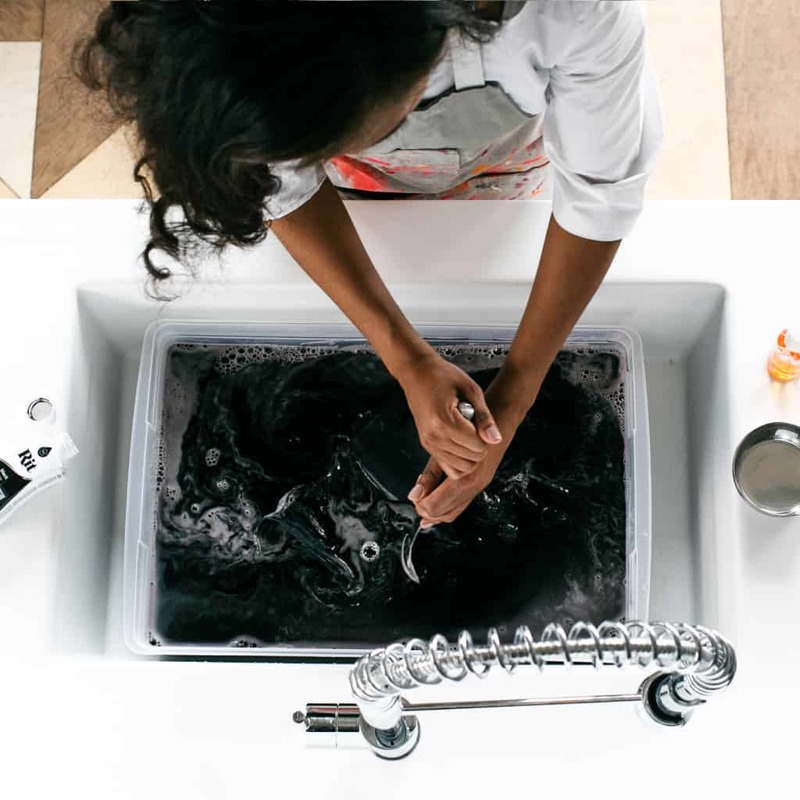 For general dye projects, follow the sink or bucket method directions below. 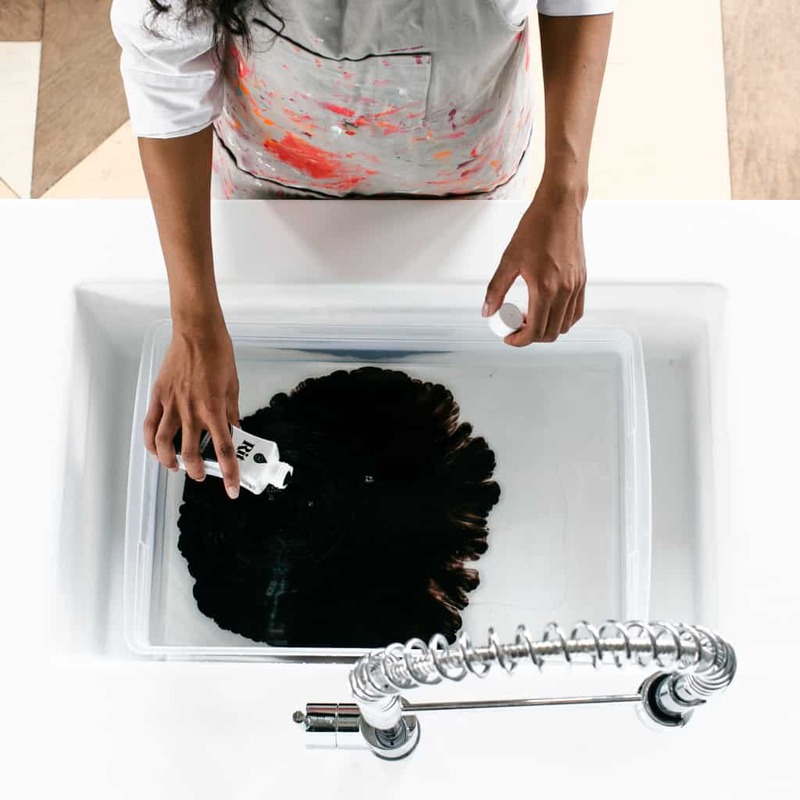 If you are looking to achieve as vibrant a color as possible, follow the stovetop method instructions further down the page. 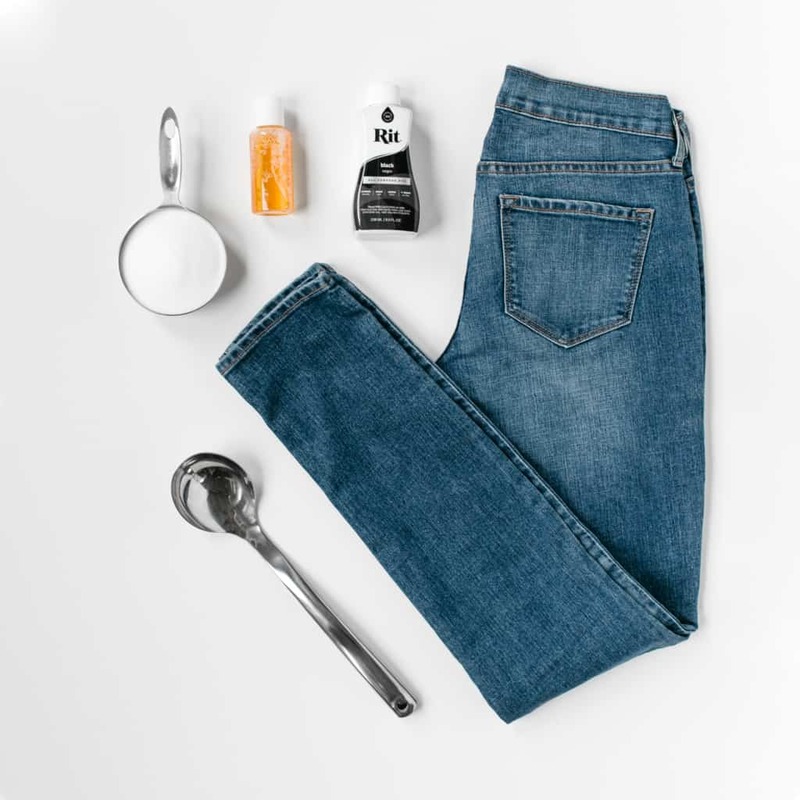 Before dyeing, remove any visibile stains on the jeans. This will help achieve uniform color results when dyeing. Prewash them in warm, soapy water. This helps to remove any finishes that may interfere with dye absorption. 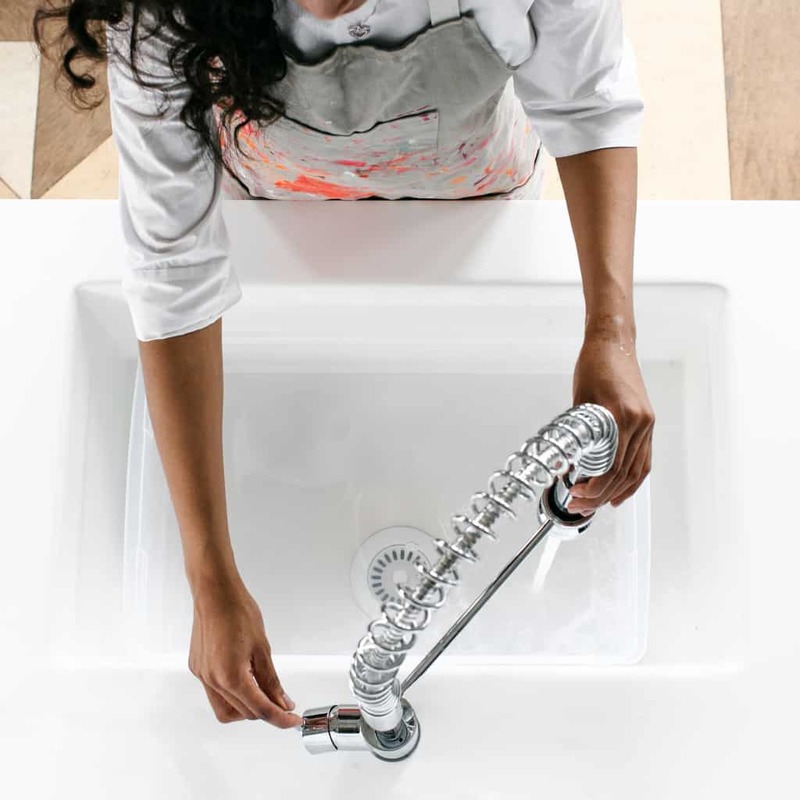 Fill a plastic container or stainless steel sink with three gallons of hot water. There needs to be enough water for the jeans to move freely. The water should ideally be 140ºF. If tap water is not hot enough, heat water on the stove and add to the dyebath. To enhance the color, add one cup of salt. We generally recommend using 1/2 cup of liquid dye (or one powder dye package) to dye one pairs of jeans. However, if you are trying to achieve the darkest color possible, we recommend using the whole bottle (or two packages of powder dye). Add well-shaken dye to dye bath. Wet the jeans and add them to the dyebath. Item can remain in dyebath from 10 minutes up to one hour. If dyeing a polyester cotton blend, keep the fabric in the dyebath for at least 30 minutes to ensure that the color takes fully. When desired color is achieved, remove from dyebath. Jeans will look darker when wet and will dry lighter. Squeeze out excess dye. Before dyeing, remove any visibile stains on the jeans. This will help achieve uniform color results when dyeing. Prewash then in warm, soapy water. This helps to remove any finishes that may interfere with dye absorption. Cover area around stove with plastic table cover and have paper towels handy to protect against any possible spills. Fill a stainless steel pot with three gallons of hot water. There needs to be enough water for the jeans to move freely. Cover pot and heat water on stove top to just below boiling (or 180 F°). Since you are trying to achieve the darkest color possible, we recommend using a whole bottle of liquid dye (or two packages of powder dye). Item can remain in dyebath from 10 minutes up to one hour. If dyeing polyester or a polyester cotton blend, keep the jeans in the dyebath for at least 30 minutes to ensure that the color takes fully. Fill a stainless steel pot with three gallons of hot water. There needs to be enough water for the jeans to move freely. Cover pot and heat water on stove top to just below boiling (200 F° or greater). We generally recommend using 1 bottle of dye to dye one pairs of jeans. However, if you are: (a) trying to achieve the darkest color possible or (b) dyeing 100% polyester, we recommend using two bottles. 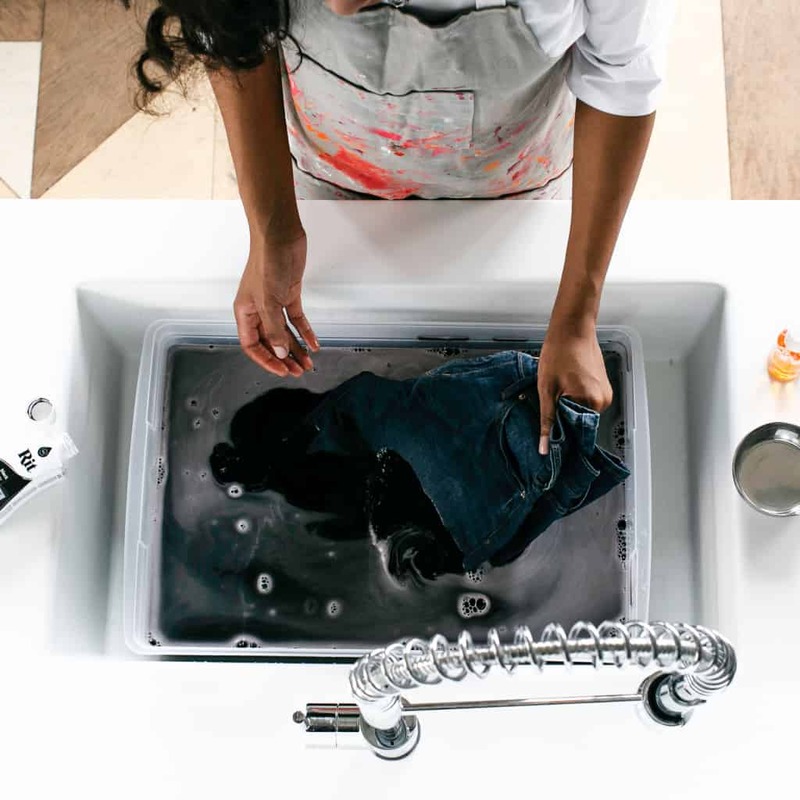 Sine you are dyeing polyester or a polyester cotton blend, keep the jeans in the dyebath for at least 30 minutes to ensure that the color takes fully.